When you walk through a big train station in Switzerland (eg. 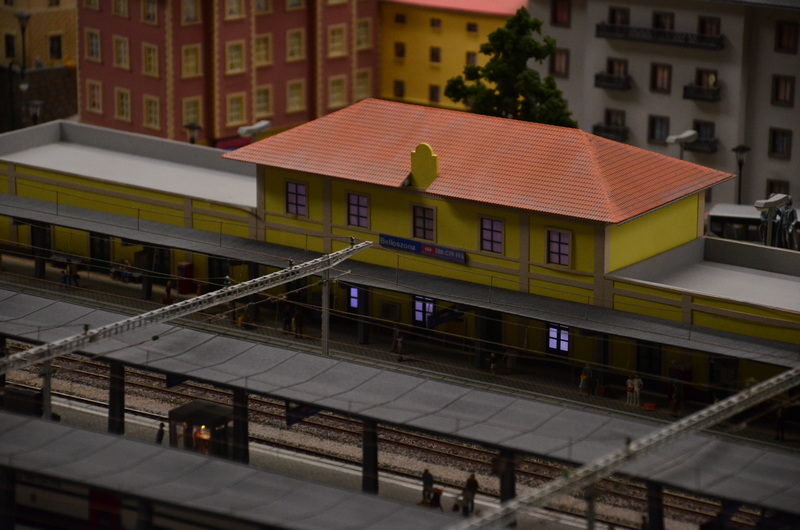 Zurich HB, or Basel SBB) it is not unusual to find stands or promoters which give free samples and discounts from all sorts of brands and products. Sometimes they advertise a new innovative product on the market or sometimes it is just a new flavor or packaging from your favorite brands. No matter if they give you just a small sample or the full size, I think this is a great way to advertise a product because it gives the possibility to actually try the thing and decide on your own whether you like it and wanna buy or not. I am not saying that I don’t watch TV and that I am not influenced as everyone else by commercials but honestly sometimes they don’t make much sense. Honestly who really cares if a super paid beautiful supermodel, football player or actor/actress – that is probably in a low carb, gluten free, in the zone diet – thinks that a pasta sauce is super: he/she is no expert (and I am not sure he has even tasted it!). Sometimes they give merchandise but that really doesn’t work for me: why should I have a bracelet/T-Shirt/baseball cap with the name of a famous brand of chocolate/cola/cookies. Who wants it? Even if shopping bags are always welcomed, I must admit. So to me old good sample is what works best. Every now and then this marketing strategy can lead to awkward situations. Like the one time a lady dropped a packet of cream filled biscuits in my basket while I was shopping at Coop and I thought it was some sort of scam and try to return it at the counter (facing the disbelief of the waitress). Or the time a girl literally forced in my hands a packet of dog and cat food (I don’t have pets). Luckily there was a “cat lady” outside the station collecting all the non-wanted gifts. A garden of Tarots. A garden of love. This summer has not been very generous in Switzerland (and probably in the rest of Europe too). We didn’t have much sun and we had just few occasions to spend time outside and swim in the lakes and rivers. So we thought to take some time off and head to Italy. 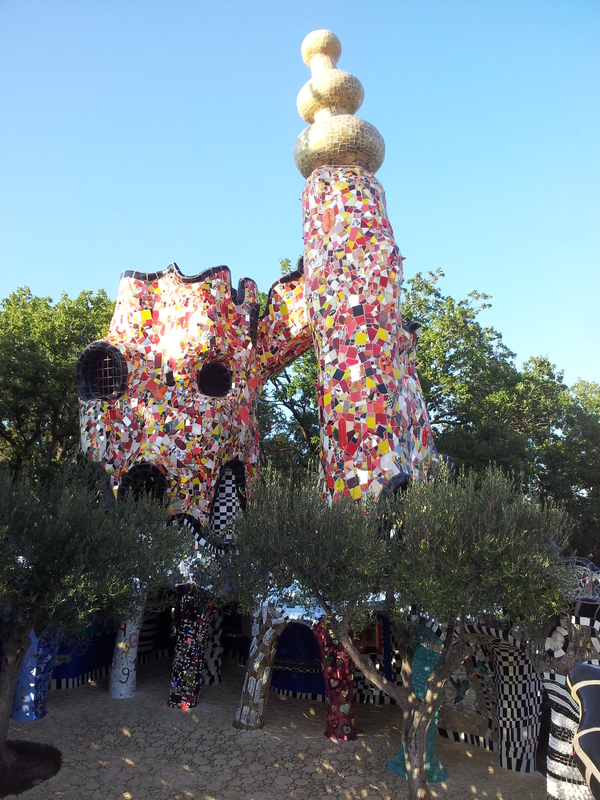 But as usual we got homesick after a while and when my friend Bea reminded me of Swiss-French artist Niki de Saint Phalle’s Garden of Tarot (in Italian “Giardino dei Tarocchi”), I knew right away that I couldn’t miss it this time. We noticed cars with Swiss plates in the parking outside right when we arrived. 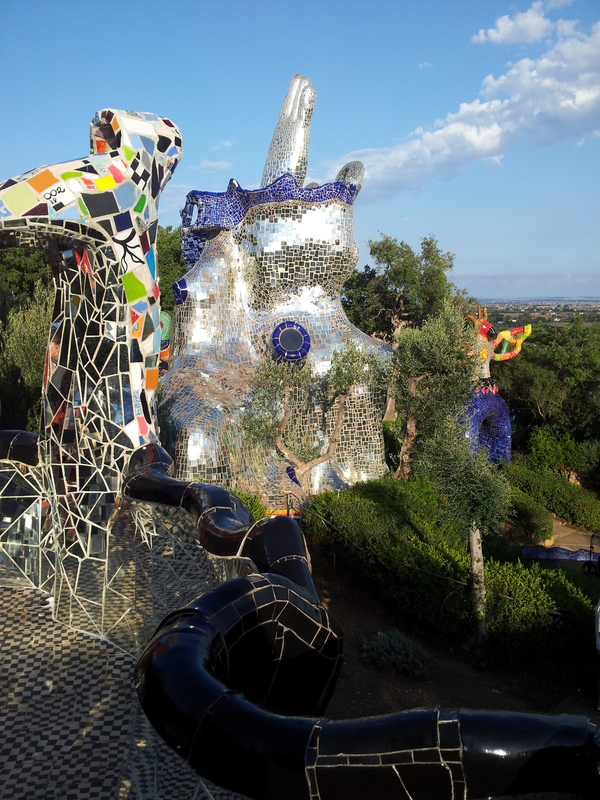 Inspired by Gaudì’s Parc Guell and Garden of Bomarzo, Niki de Saint Phalle started building her garden in 1979 with her husband, Swiss artist Jean Tinguely, near Pescia Fiorentina (Tuscany, at the border of Latium). 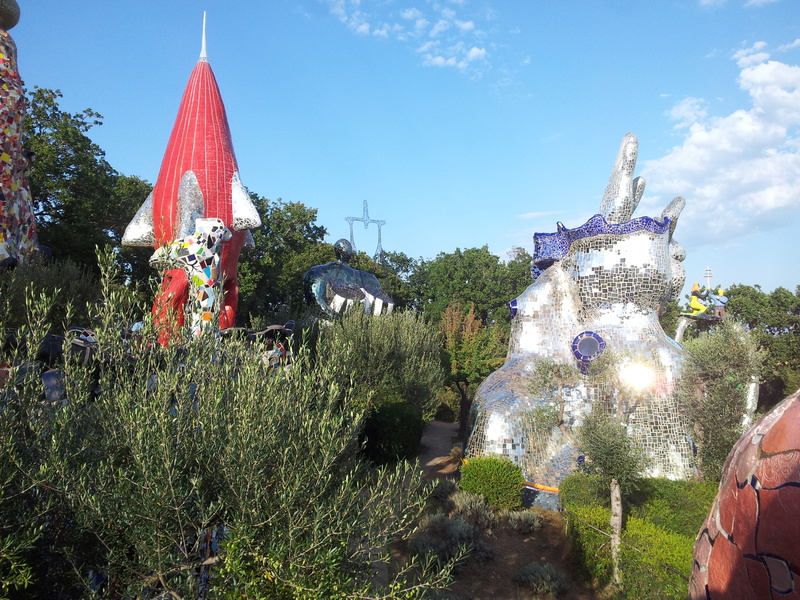 Decorated with 22 giant sculptures, inspired to the tarots, it is a beautiful example of artist’s garden. 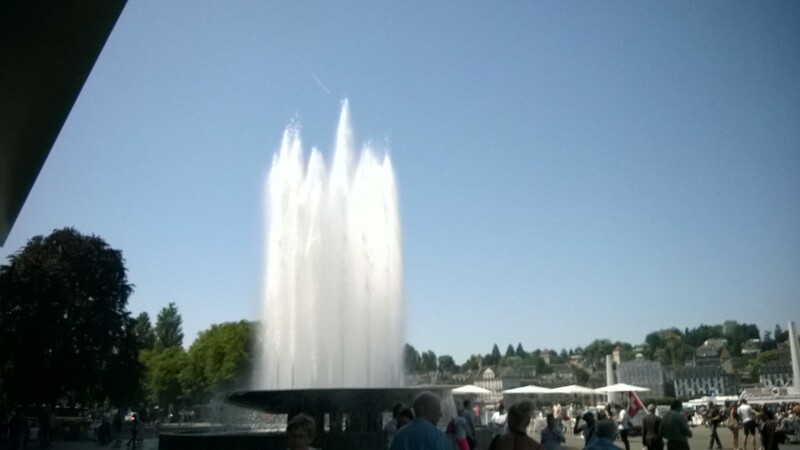 It is opened only in Spring and Summer as it needs a lot of maintenance and water in the fountains could freeze. 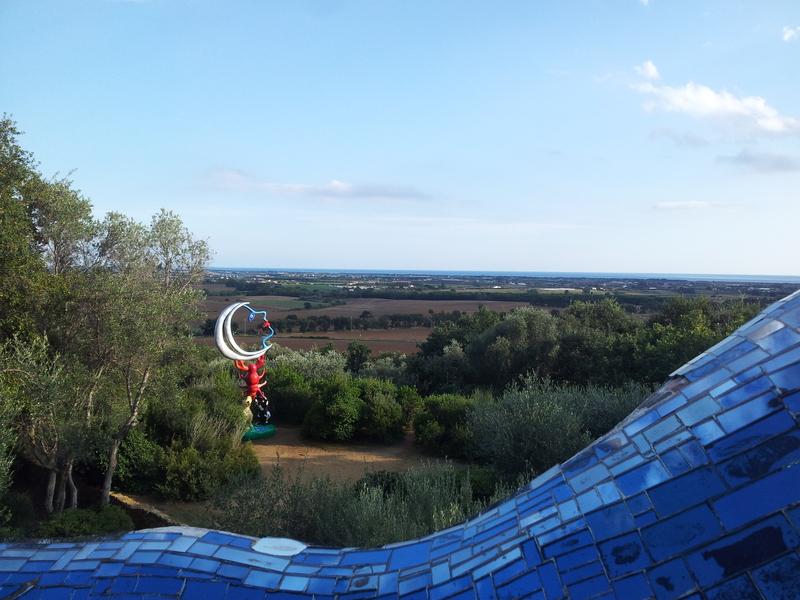 The visitor is welcomed by the words of the artist that was deeply in love with Italy and its beauties. 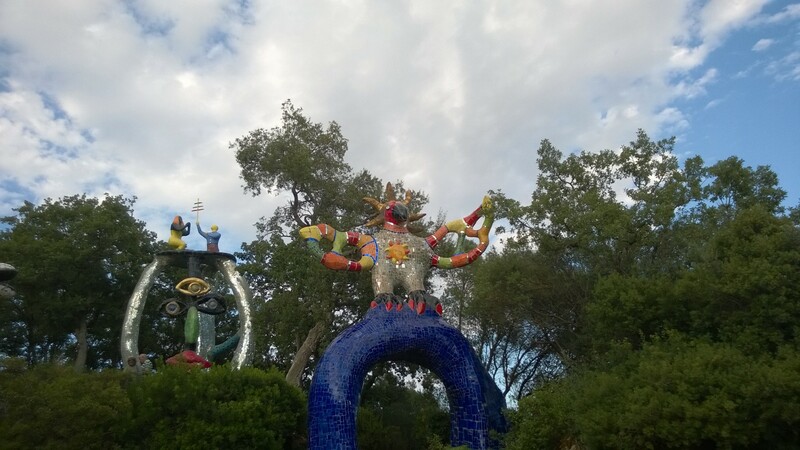 From the entrance the visitor is surrounded by the colors, sounds and scents of the garden and the giant sculptures and fountains by Niki de Saint Phalle, which include Tinguely’s mobile metal sculptures/machines. 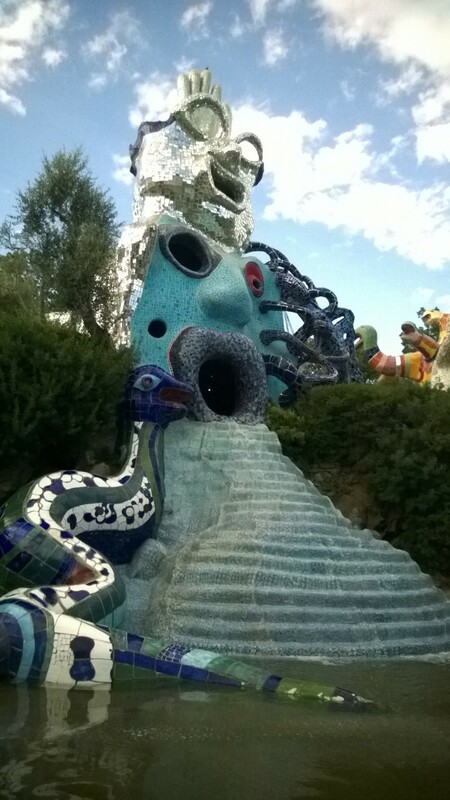 Ceramics were casted exclusively for this place so it took more almost 20 years to finish the work. The eye can’t rest: every single detail is perfect. 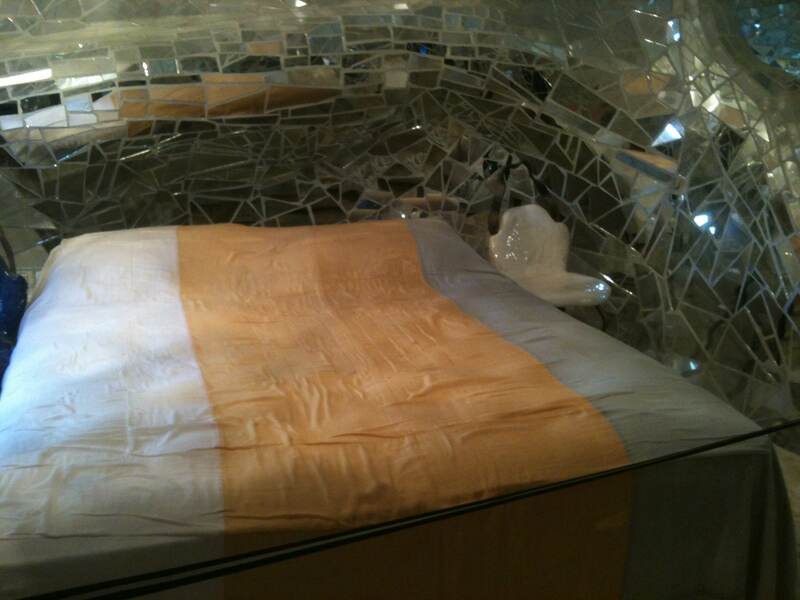 The sculptures are covered with ceramic tiles, glasses, mirrors. 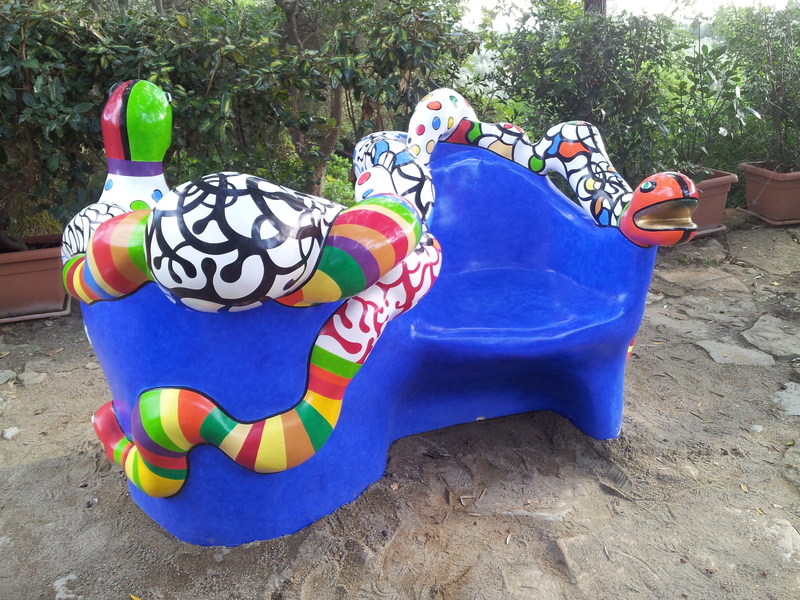 Every tile and briquette is either decorated or inscribed by the artist. 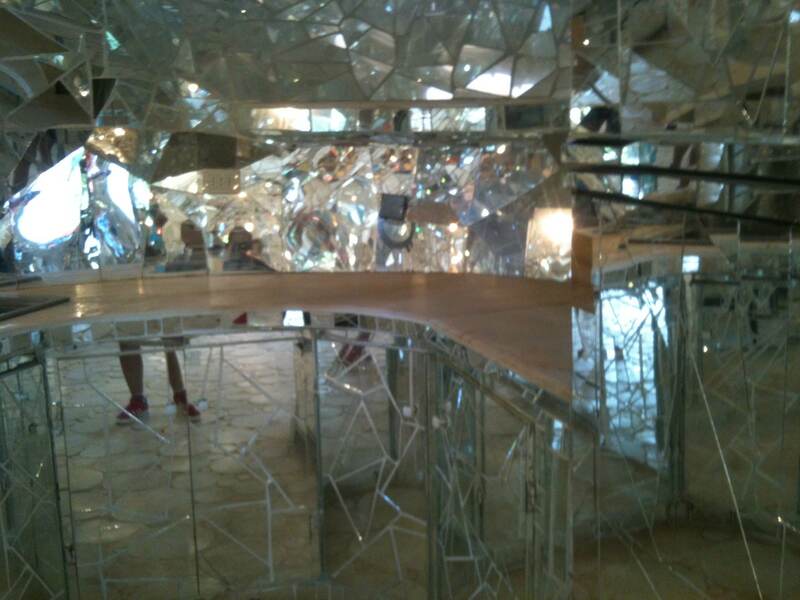 Some of the sculptures are actually architectures that can be explored inside (including a fully equipped apartment with a bedchamber, a bathroom and a kitchen covered with mirrors) or on the top. Chairs and seats of various kind were everywhere so we could relax a little bit and enjoy the beautiful view. The echo of the thoughts of the artists, inscribed in words on the floor, continues to accompany the visitor, guiding him or her in the long loving process of building such a place. 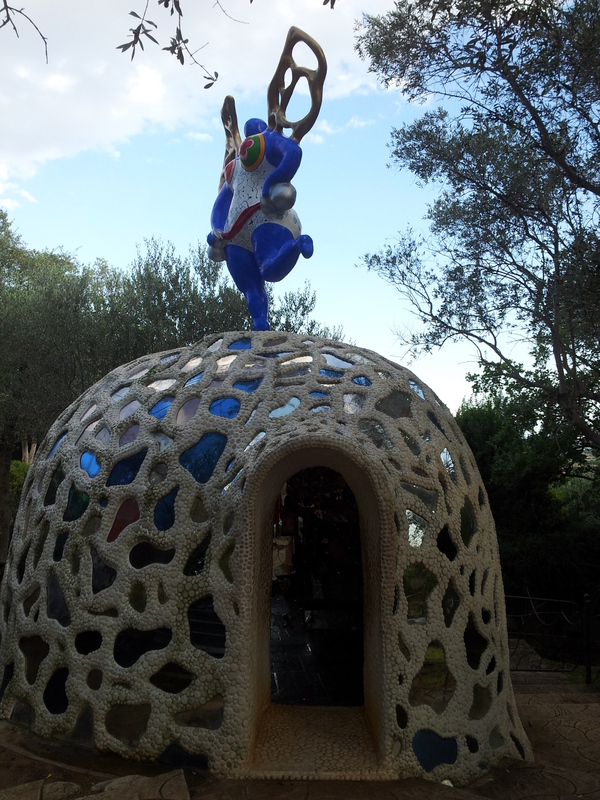 The playful and joyful mood of the place makes it a perfect venue if you are visiting with kids. 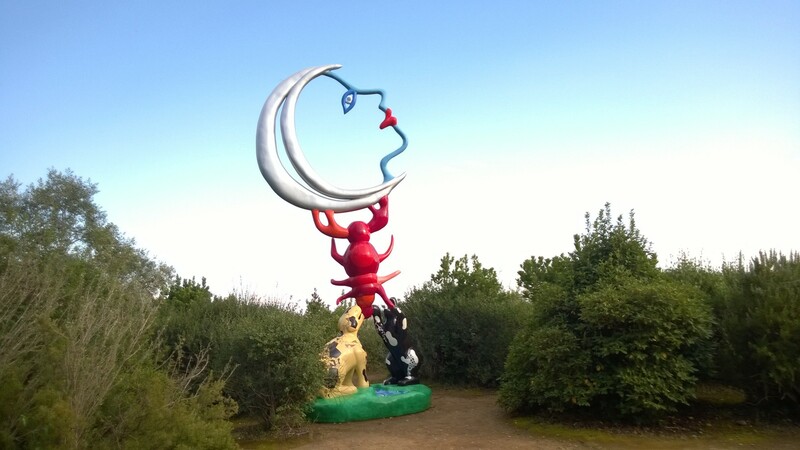 Furthermore the visit doesn’t take long (kind of 1h) and it doesn’t need much walking so it is suitable for all ages. 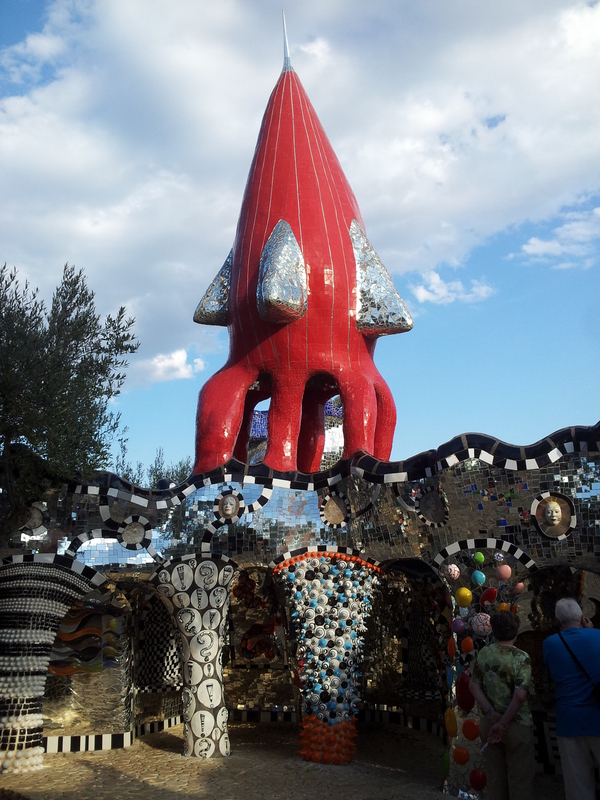 I hope that next summer I will be able to go back with my friend Bea and her mom as I am pretty sure they would love it! (ps. 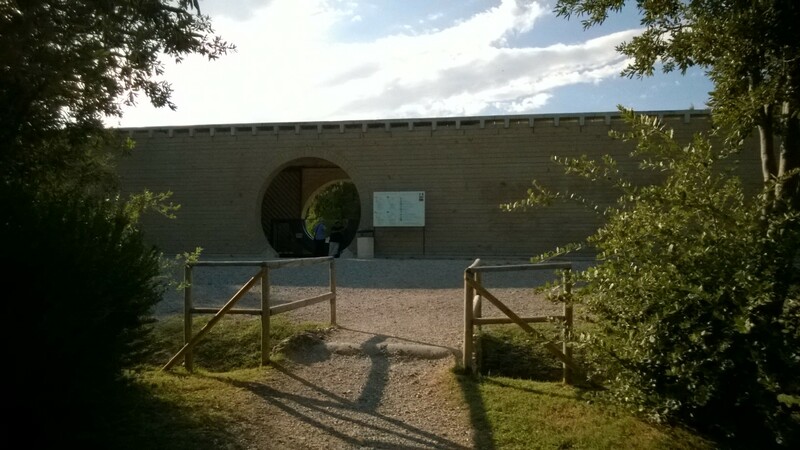 I am not the only one who visited the Gardens of Tarots this Summer: my friend from blocal-travel wrote a beautiful post about it – and Bomarzo garden. Check it out! Kosovar Albanian New York based artist Sislej Xhafa installed a gigantic Y in 2011 at Hardaupark, Zurich, as part of a public art project. 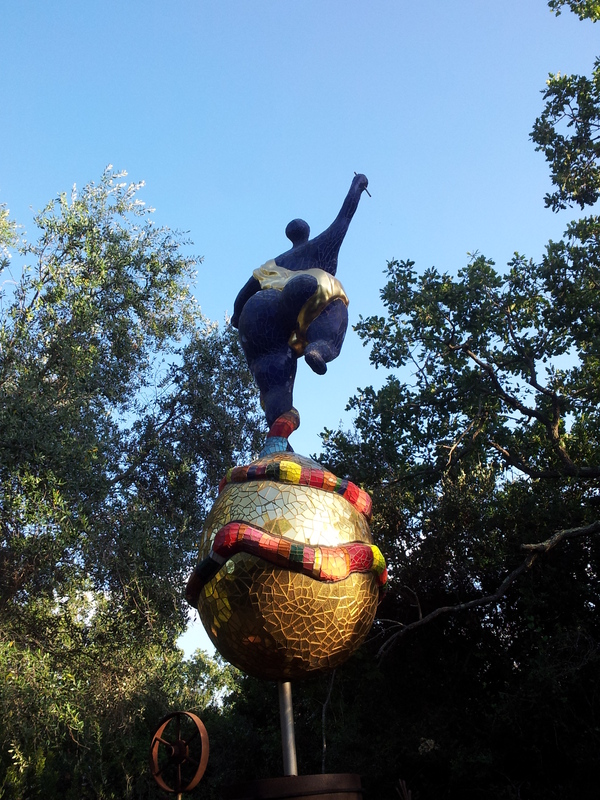 The work, that evoke’s King David’s biblical sling, is also a real swing, that can be used by the residents of Hardaupark and visitors, children included. 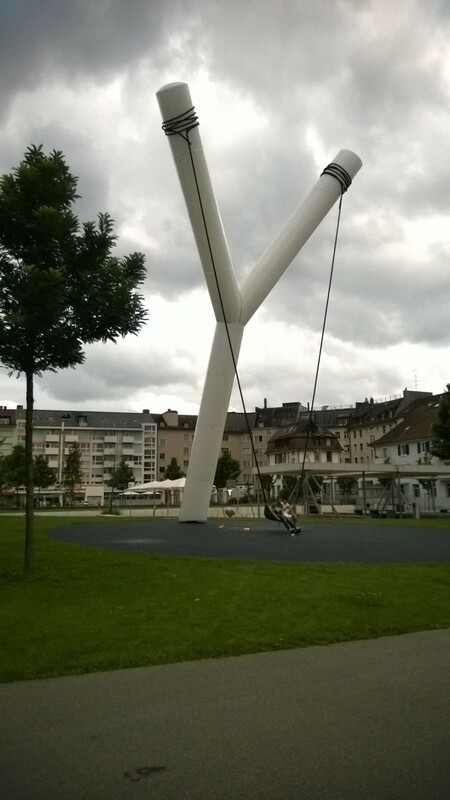 It is really impressive, especially if you are not expecting it: I didn’t dare to try but they say it is perfectly safe…When I was a kid I used to love swings: my school had many and it was our favourite hobby at the lunch break. Anyway I think it’s king of 25 years that I don’t sit on one of those things so it feels kind of strange to me thinking of using this gigantic Y swing. 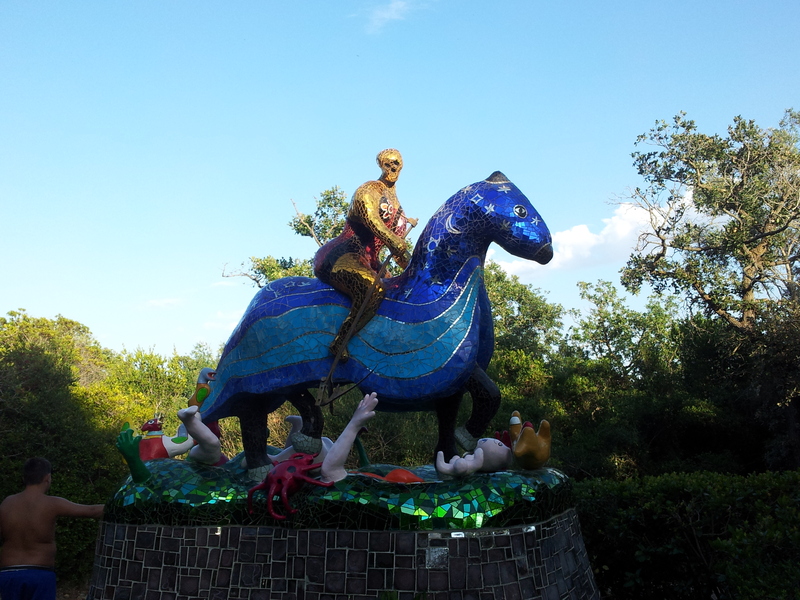 But I think the fact that is an artwork makes it much much more interesting and fun. The other day the weather unfortunately was not that good (well this is not something exceptional for this summer!) and I was a bit in a hurry so I think I will get back to it soon and try and take some better pictures for you guys! 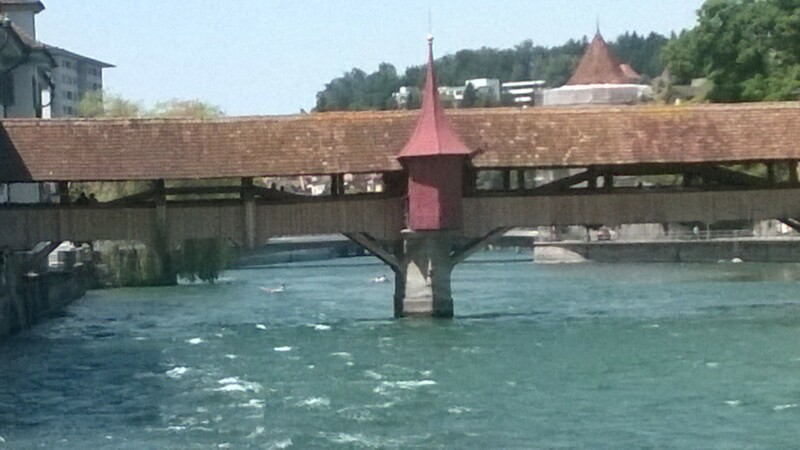 Since I moved to Switzerland, I started noticing Swiss products, Swiss typical architectures and traces of Swiss history every time I travel in other countries. During my last travel to France I kept looking for Swiss products in the shops and Swiss brands at malls. 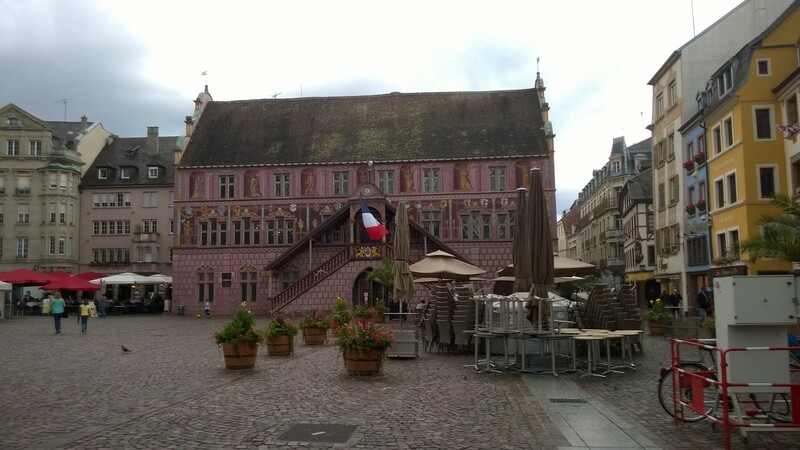 This Saturday I was in Mulhouse, France, not far from the Swiss border, to spend some nice relaxing day with my husband. A sort of post holidays decompression. We paid the usual visit to Fnac and to the local store from Canal BD, and had lunch in a fancy creperie (the amount of cholesterol in my galette au 4 fromages probably exceeded the recommended annual amount but who cares?). Later we visited the City Museum, hosted in what used to be once the Town Hall, which retraces the history of the Republic of Mulhouse (free entrance!). 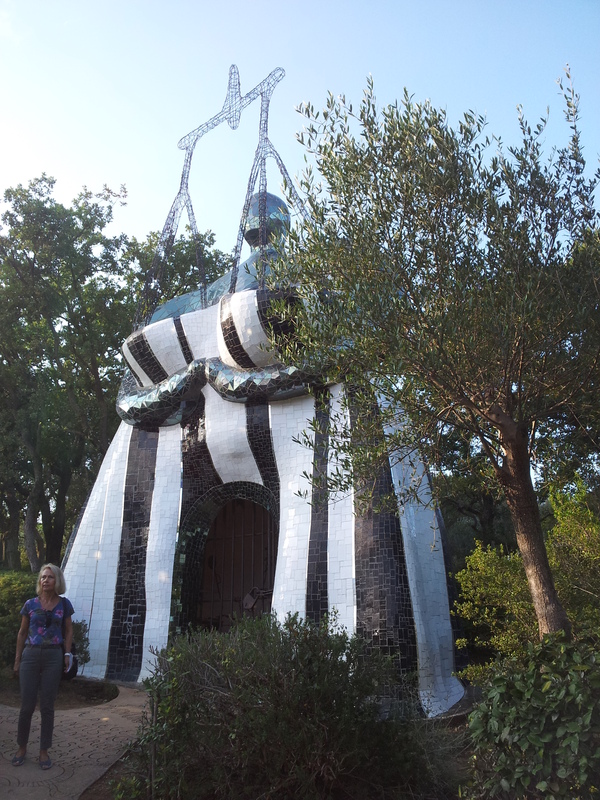 The most interesting part was for sure the decorated main hall that is today used for wedding ceremonies. 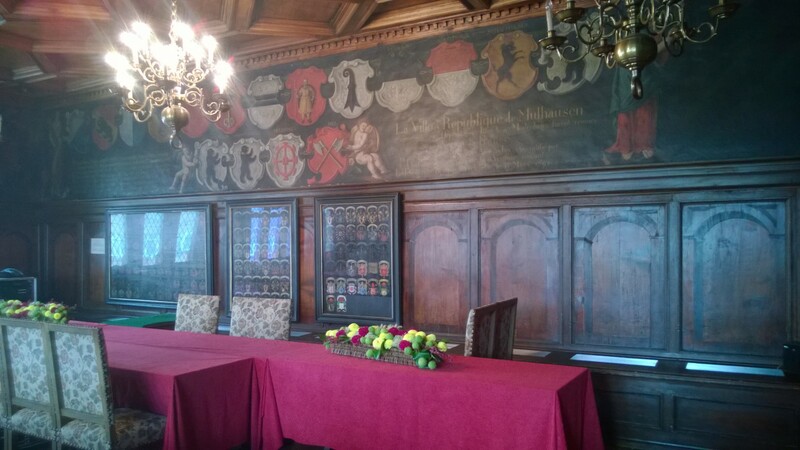 From the walls we immediately recognized the stems of Swiss Cantons (Mulhouse was a republic allied to the Swiss federation) ! Can you recognize all of them? I am still working to it but my husband is an expert. Maybe one day I will be too. 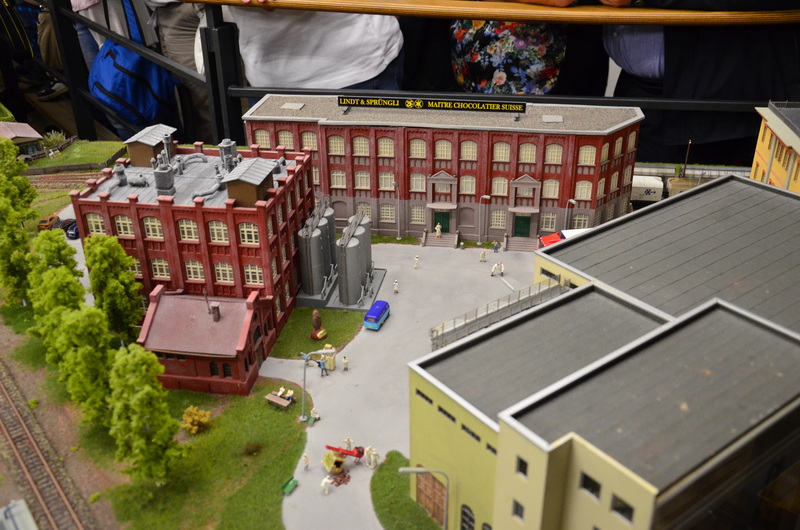 In the meantime I enjoy some guided tours from him…. A pretzel for your thoughts! 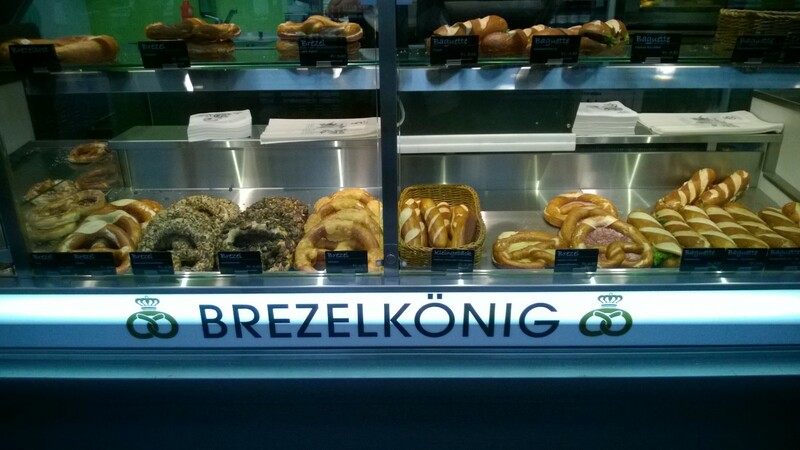 One of the most common bread snack in Switzerland is definitely pretzel (in German Bretzel). You can find it everywhere and at every flavor (raclette is definitely my favorite!). So I was surprise to learn from some locals that is kind of a new thing here in Switzerland, as it was imported some years ago from Germany. Differently from Germany, I don’t know why you can’t find so much pretzels in Swiss pubs. My question is: aren’t they supposed to accompany a pint of beer or a panache? Anyway they seem to be simply perfect for any afternoon snack or at lunch filled with cheeses or hams. Sometimes I simply make them at home following Laura Vitale’s super simple recipe (believe me any of you could do it with one hand!). It’s definitely cheaper, you can use them for a brunch and you can also make a sweet cinnamon typology. 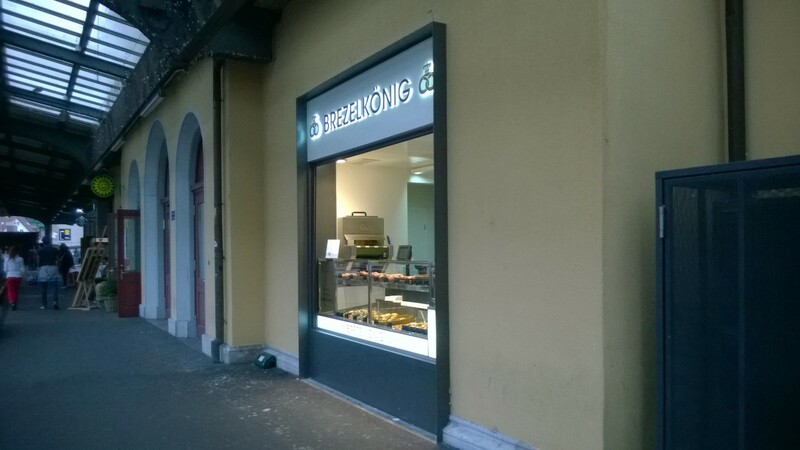 Since I moved here, I tried pretzels from most of the companies and I have come to the conclusion that there is nothing better than a salzbrezel (salty pretzel) at 2 CHF from Bretzelkoenig (probably THE cheapest warm snack you can buy in Switzerland, and in Zurich in particular). Just from the oven, it’s fresh and still warm. Not too big, not too small. With the right amount of salt. Simply perfect. A real treat in this cold summer. 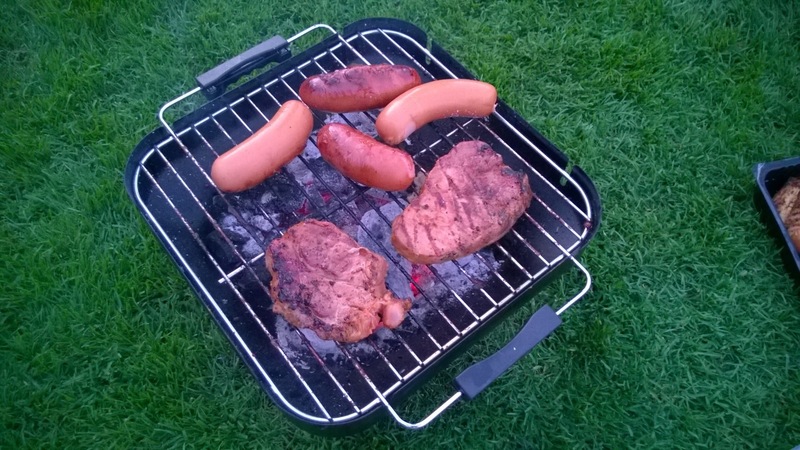 Yesterday, as planned, I finally had my first Swiss National Day barbecue. 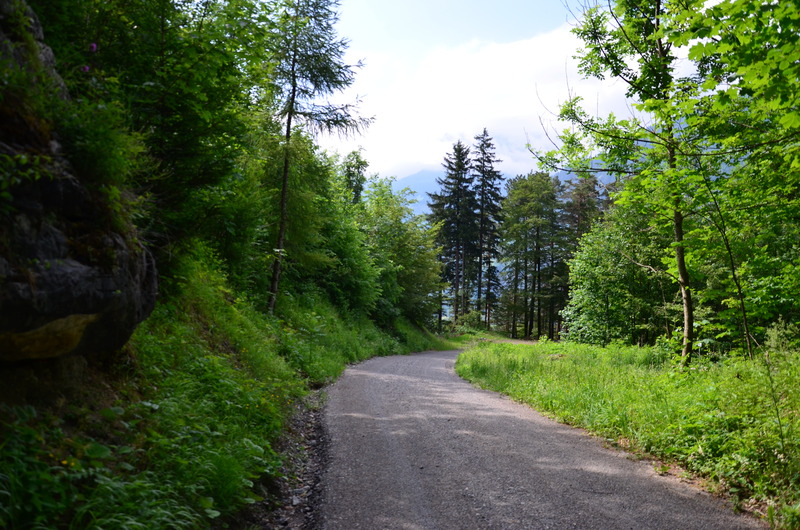 On Thursday (a bit late but still with plenty of time) I had sent a bunch of emails to invite some friends and colleagues but I was a bit afraid that not many people would have still been around: many had already left for a long weekend on the mountains or in Ticino. Lucky me some had stayed and we manage to organize a early evening barbecue. But then another issue came along: where? 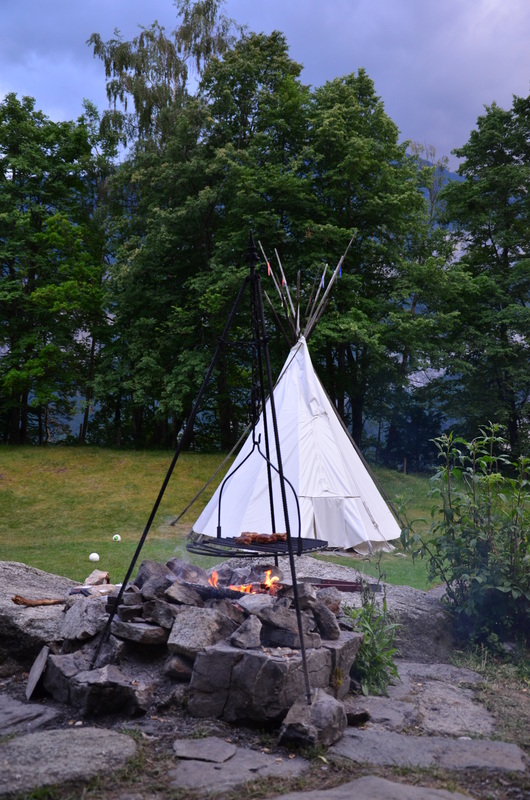 In fact, the choice of the spot in these cases is crucial: having picnics and barbecuing is a national sport for Swiss people and they are experts on where to find the best spots with facilities such as public grill, toilets and drinkable water. Some people arrive early in the day to occupy the best places and sometimes there is so much people you can’t even stand let alone to sit and eat! 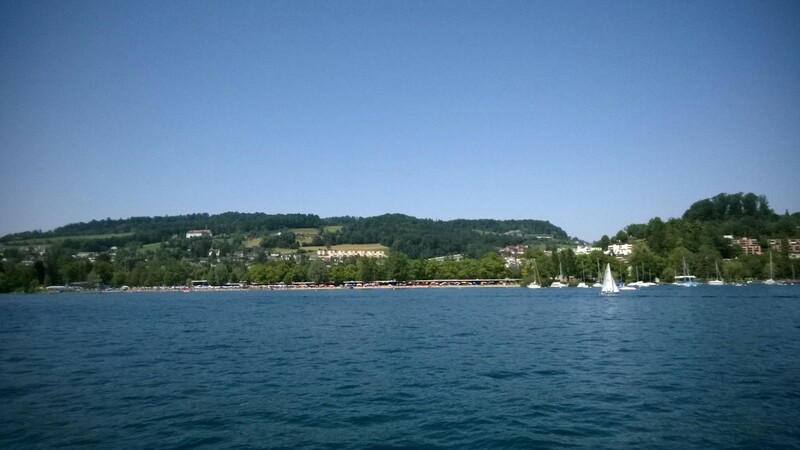 One of my friends – very wisely I must admit – suggested to avoid renown places (our first choice was the coast of Lake Zurich in front of the Chinese Garden), and another one mentioned “Enge Wiese”, a nice lawn that is on the other side of the Lake. We didn’t know much about it but we trusted some cool pics found on internet …and we were right. The place was awesome, full of young people having fun and listening to music. Unfortunately no public barbecue available, but we brought ours! We had forgotten (like most of the people there as we learnt) some form of accelerator to start the fire but some good Samaritans lent us their. 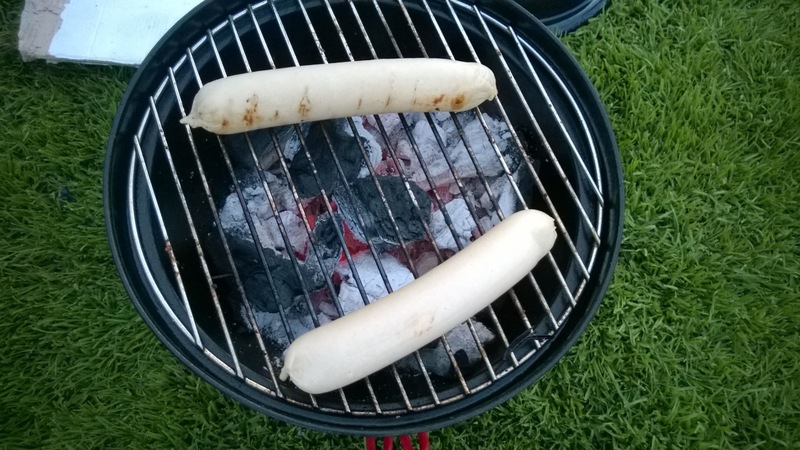 Before 8 everything was set and barbecued as the true Swiss do (bratwurst, cervelat and stuff like these!). 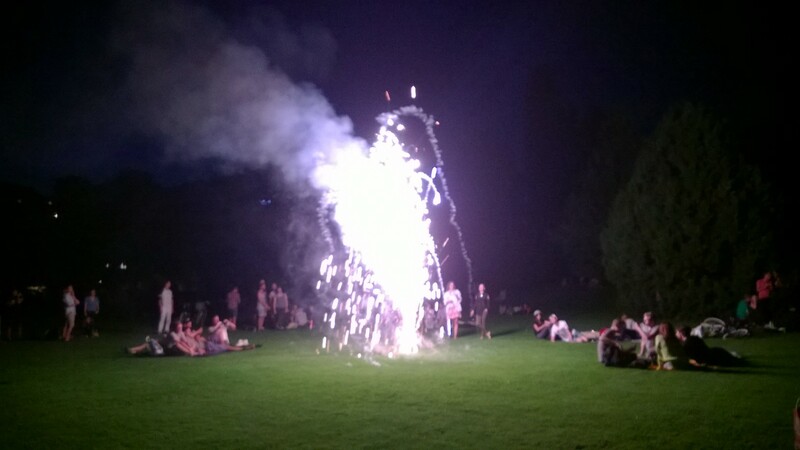 We were a bit disappointed as we learnt from the internet there was not going to be an official fireworks program from the City of Zurich but close to 9 o’ clock people started making their own fireworks. 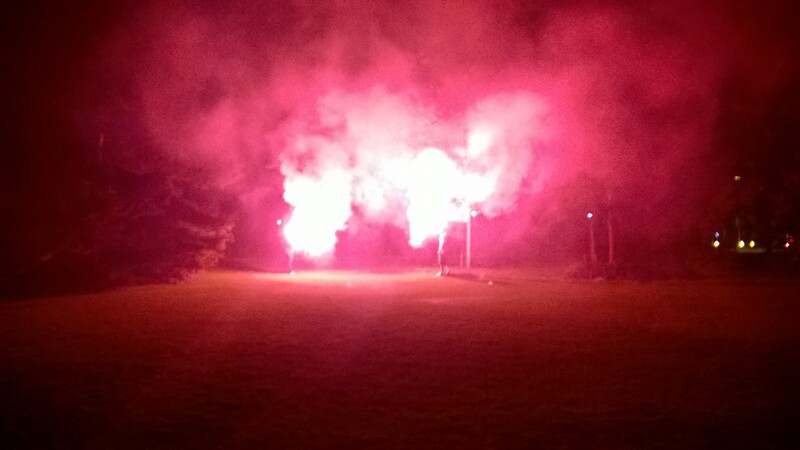 And people went crazy lighting up all sort of fountains, fireworks and lights (the red ones were the coolest!). And a group of people started to sing “happy birthday to you”. At first we didn’t understand: we thought it was one of them’s birthday and then we got it. They were singing it for Switzerland, to celebrate its foundation with the Federal Charter in the early days of August of 1291! So I must admit: it was a very cool birthday party for such an oldie! 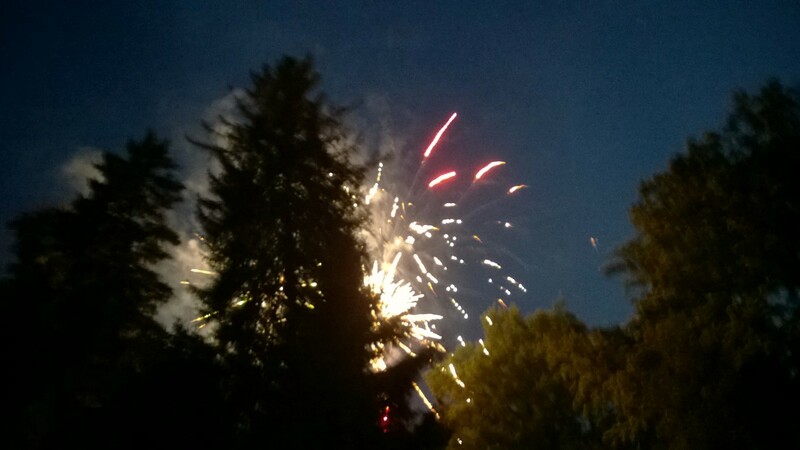 July is coming to an end and Swiss National Day is coming up. 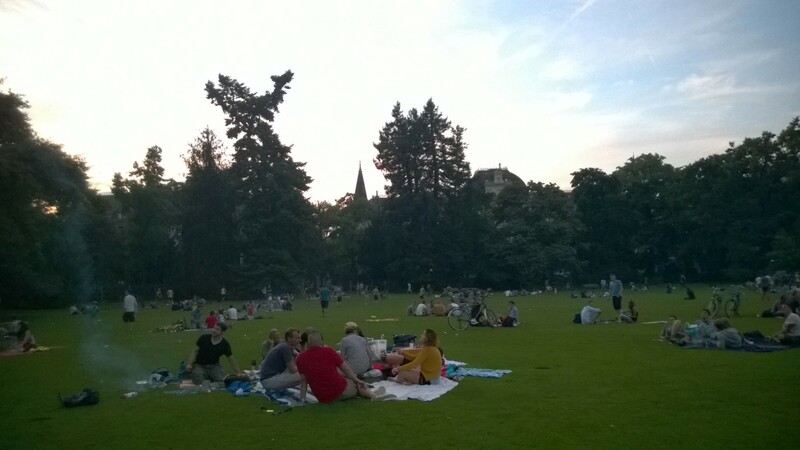 It is quite a recent public holiday but Swiss really seem to love it as it is the perfect excuse for a good picnic (in case you’ve missed it, grilling is the most common summer sport here!). And as usual Migros and Coop are coming up with all sorts of Swiss flag merchandises: disposable plates and cups for picnics, paper caps, balls, and even… baby clothes. I will never get over this: in no other country in the world people love to wear the flag on a daily basis like in Switzerland. And they put it everywhere! So my big question at moment is: what should I do? Buying Swiss flag stuff and celebrating like a local or behaving like any other day as it is no big deal as I am not Swiss and I don’t feel like one? The other option is taking something red and to put a cross on it (a very creative girl I know recently did it with some toilet paper!). 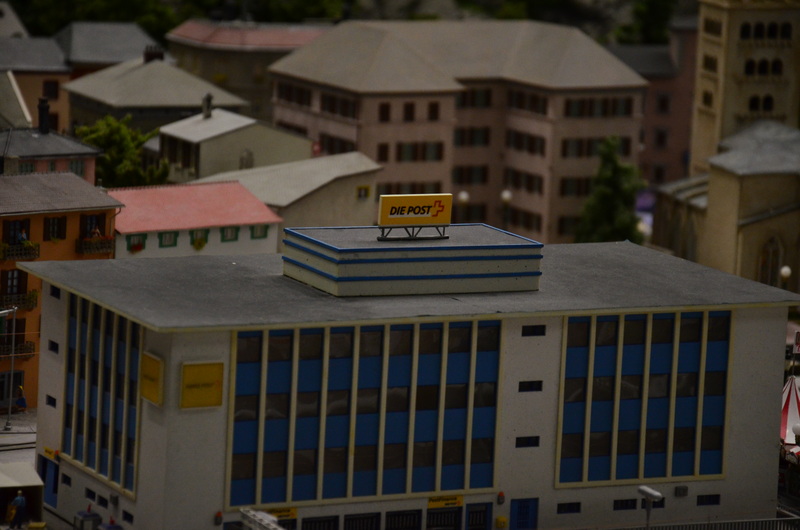 But the true answer to is: who could turn down some awesome shopping and barbecuing? 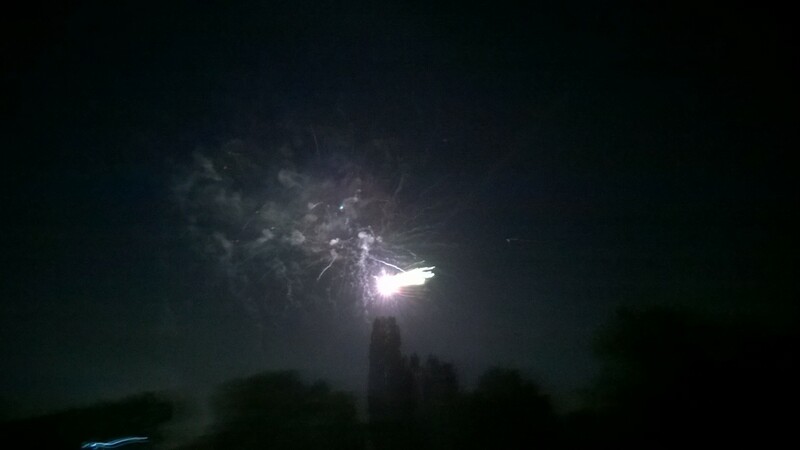 And furthermore I can get excited for fire works like a 5 years old kid! You can’t stay in Paradise forever. So, sometimes, my husband and I take a little break from our Swiss life and explore some other country. Everything at first seems a bit untidy and dirty, everything is “late”, but after a while our brain goes back to our usual Italian standards and everything looks perfectly normal from our re-established South Mediterranean perspective. 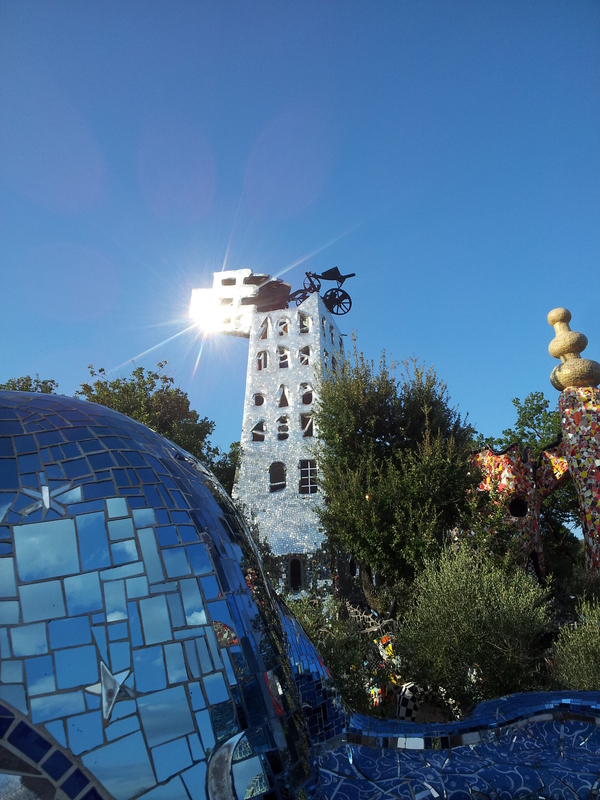 This summer, for example, we came to Hamburg and had a blast. After the first 12 hours in which the Train Station seemed filthy and the bus ran 2 minutes late, we relaxed and everything went back to normal. The city is awesome, lively and dynamic and we really enjoyed our stay. After some days, anyway, I began to feel a bit homesick…but not for my Italian home, but for my Swiss home. 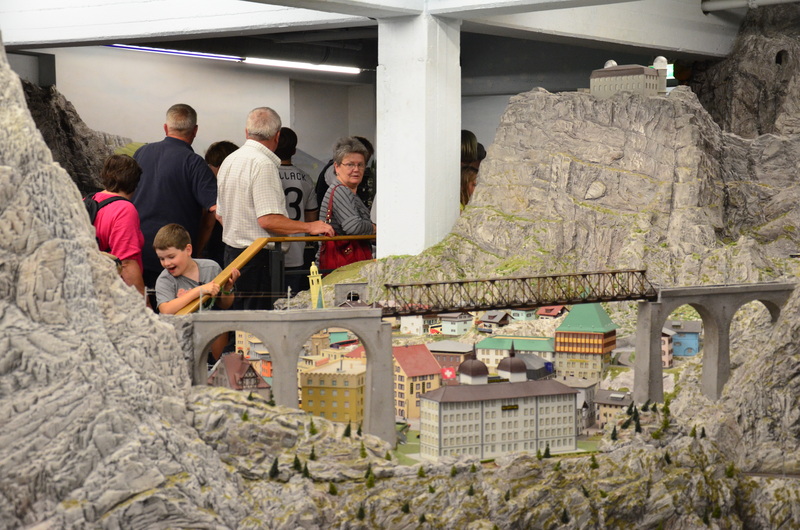 So I could believe my eyes when we visited the Hamburg Wunderland Miniature and found a miniaturized version of Switzerland. 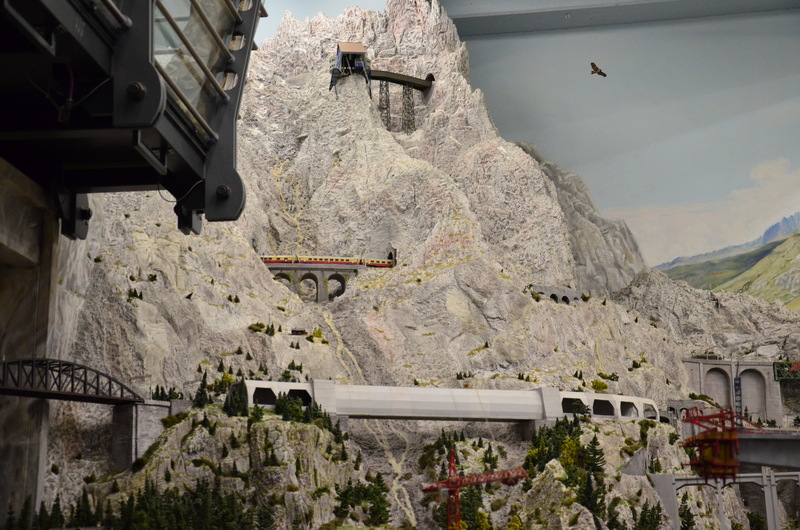 From SBB trains to the alphorn players everything was perfectly represented in details and we spent half an hour spotting every aspect that looked even vaguely familiar (like total nerds!). 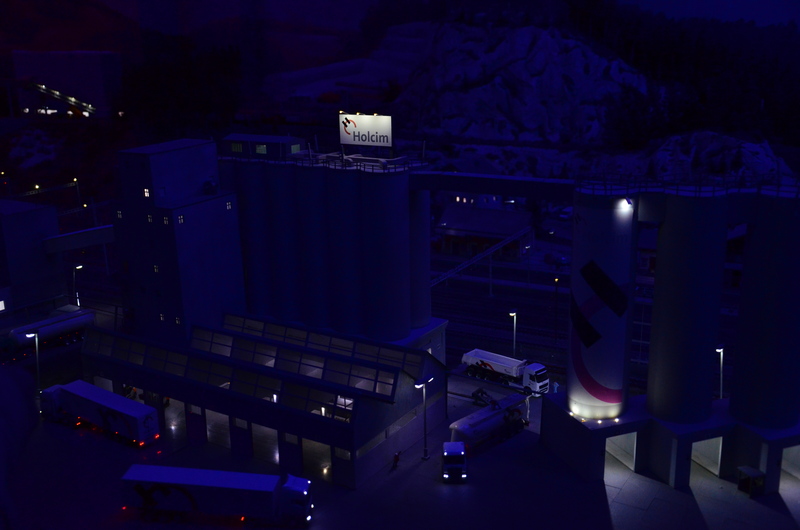 And of course we waited for every part to become dark to see the city lights effect. 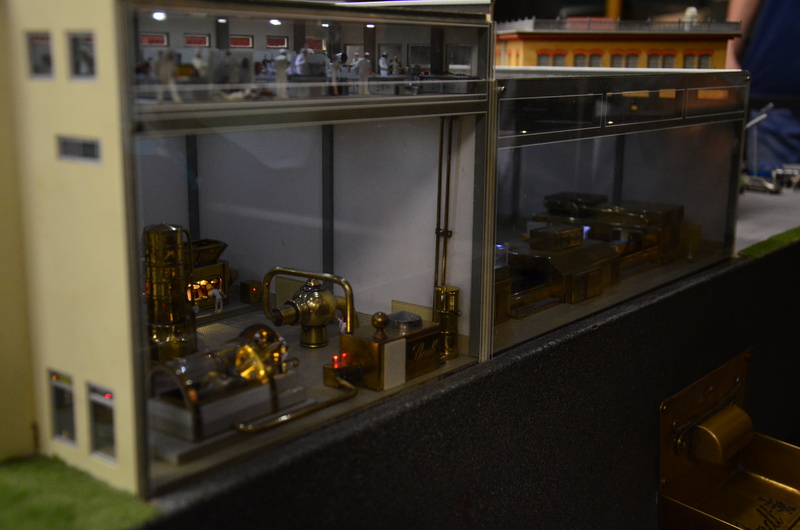 There was also a miniaturized Lindt & Sprungli Factory! So when I came back home and examined all the pics we had taken (not all, otherwise I would be still looking at them and not writing this post) I got that this is one of those moments that you have proof that you have found in Switzerland a new home. I am a city girl, always been one. No question about that. You wouldn’t say I spent most of my childhood summers at my grandma’s house in a small village in the countryside. But I guess at some point I grew up and as a young teenager got fed up with being friend with goats, collecting flowers and having long walks in the middle of nowhere. Probably life was preparing me already for my Swiss adventure, but it wasn’t for me. Sometimes I wish I had a difference attitude towards being into the wild, hiking, and such a things. But I don’t. 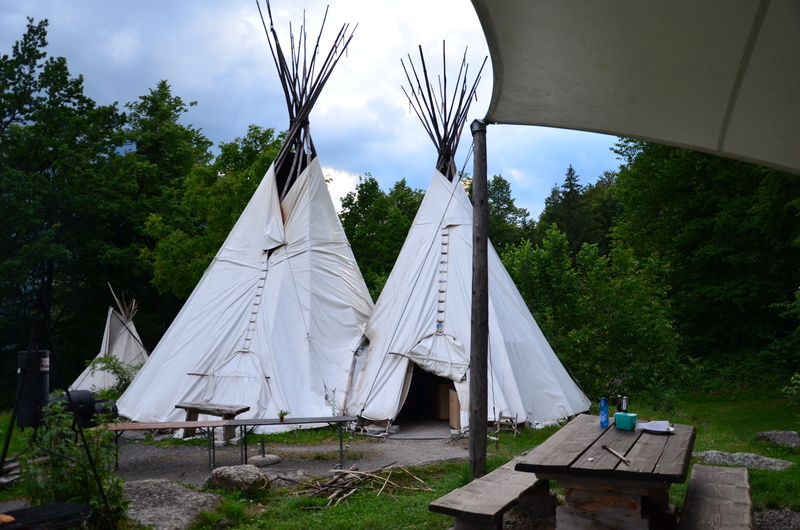 In May for my husband’s birthday I found a nice Deindeal voucher for an adventurous archery and tipi (yes, you have read well… tipi) camping weekend in the Berner Oberlan and I purchased it enthusiastically without giving much thought about a little detail: I hate camping. So last week, with not too much enthusiasm but pretending to be happy for my husband, we had our first camping trip since we moved to Switzerland. 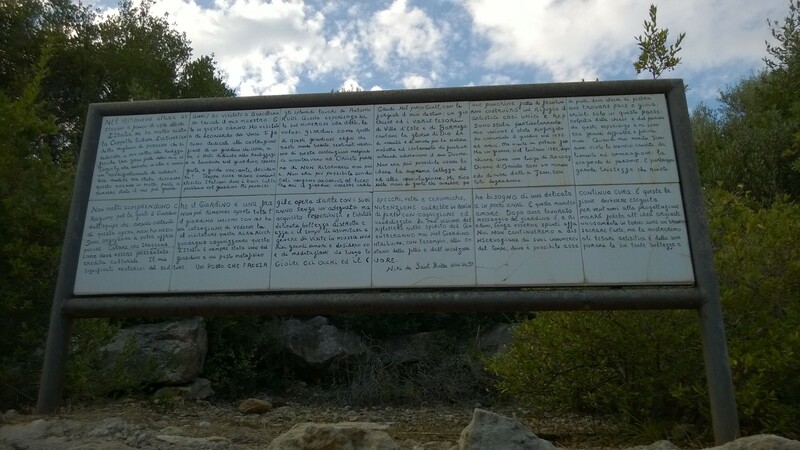 The start was not encouraging: 4 kilometers up on a hill to get to the camping. I thought my lungs were on fire at some point but luckily I made it and I was definitely rewarded for my efforts. 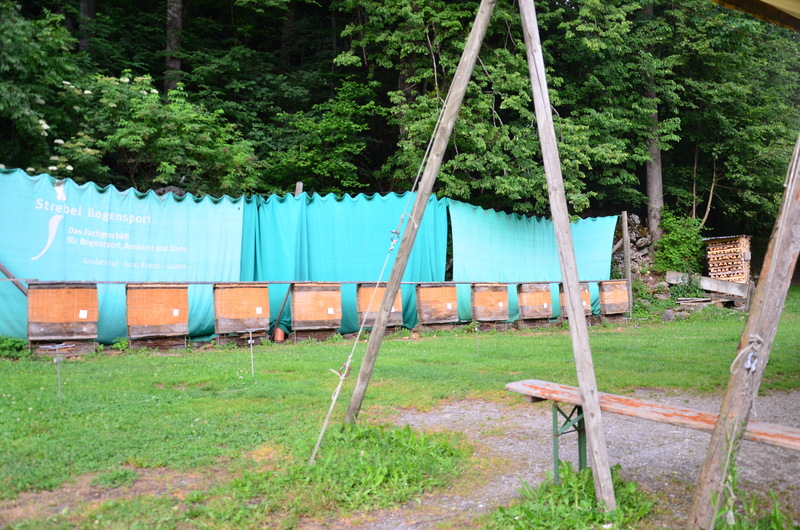 The place was super cool and the archery lesson and the archery adventure pathway was really fun (also thanks to Gary, a nice guy from Bristol, UK, who had the Robin Hood gene). We got lost a couple of times (not completely our fault as the map was just a sketch) but thanks to a merciful Swiss kid we found our way back to the camp. In the evening we had a BBQ and watch the sun go down. 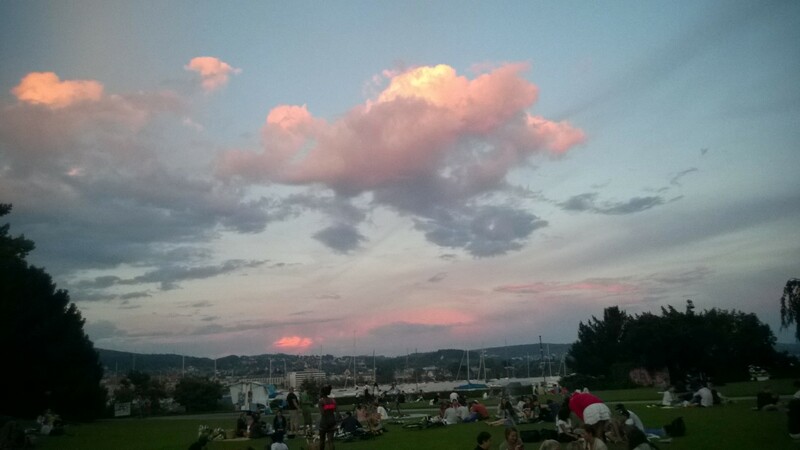 The view was fantastic: the meadow with the big tipis was beautiful in the sunset (and I won’t ruin this romantic moment with such stupid questions like: who and why got the idea of building tipis in Switzerland?). The night unfortunately was not so quite: the temperature dropped and caught us totally unprepared. 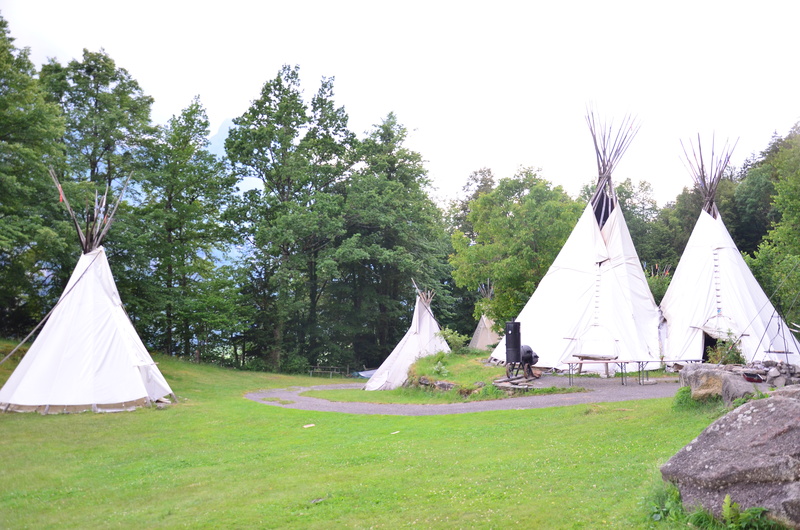 I couldn’t sleep as the wind blew on the tipi. Luckily in the morning some good hot coffee and chocolate muesli were waiting for us. 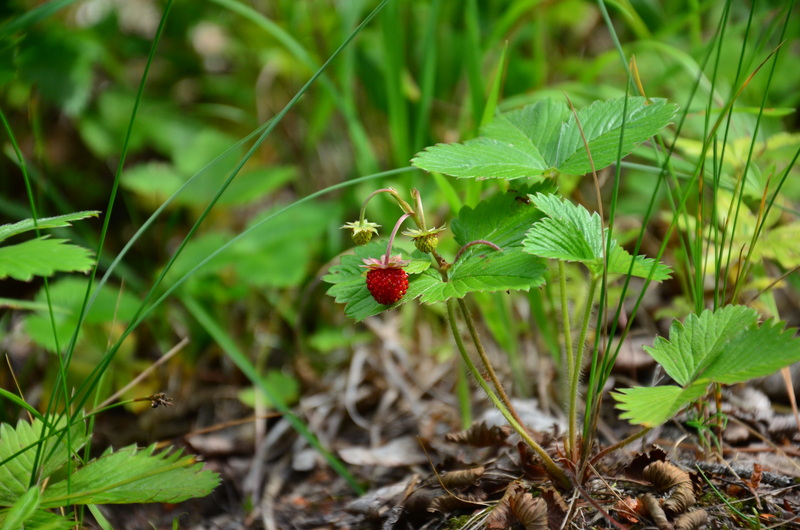 And on our way back we found another path, less stressing and full of some small wild strawberries to die for. 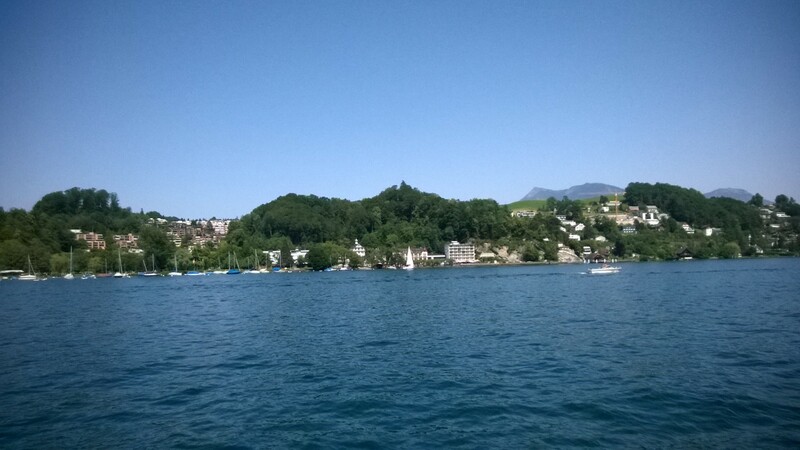 Sunday I went for a day trip to Lucerne, one of the most beautiful cities in Switzerland. It was so sunny and hot that we passed under its famous covered bridge at least 4 times, just to find some rest in the shade. 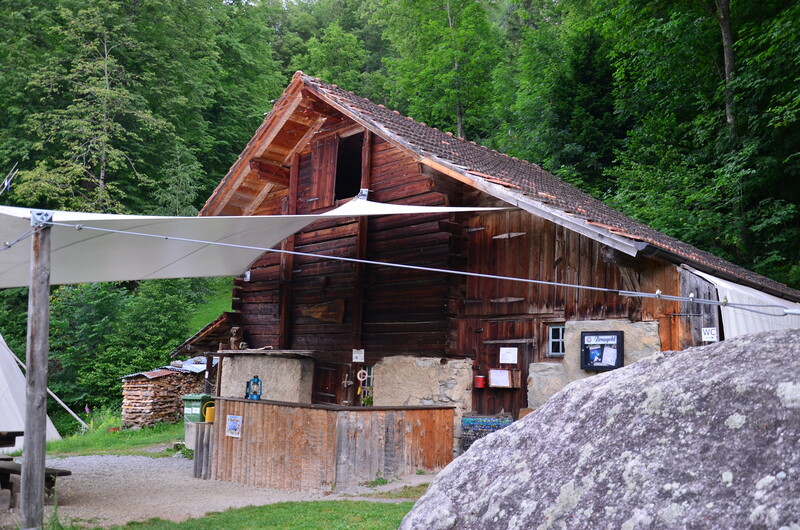 In fact when people talk about Swiss weather they usually complain for the rain and never for its heat waves (on Sunday it was 34° C) and not many Swiss cafés or restaurants have air conditioning systems. 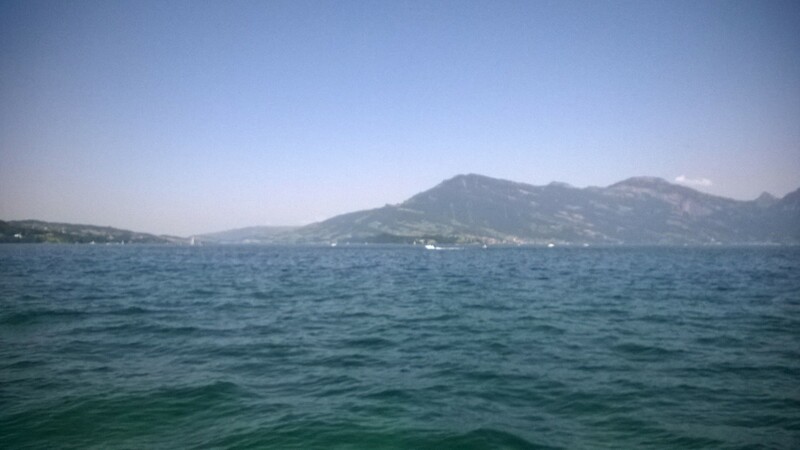 In the afternoon, tired of walking under the sun, we decided to go for a short boat trip on the lake (piers are just near the Central Station). 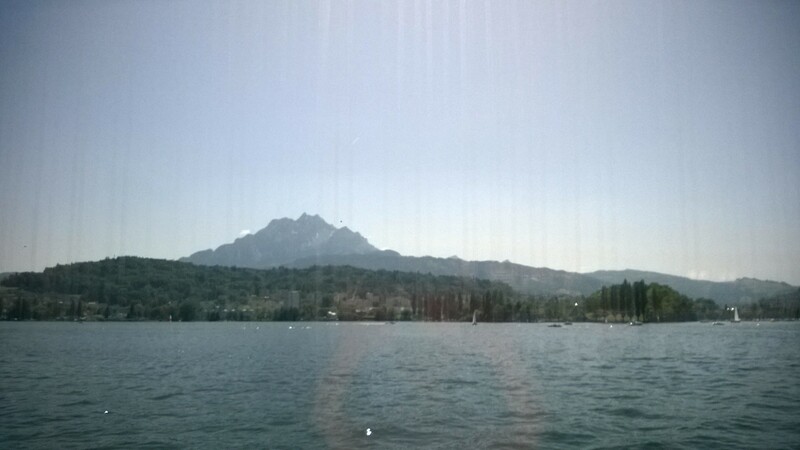 The view was amazing (the Pilatus and the Alps are pretty near) and we were kind of surprised to see that there are many little beach resorts with colored beach umbrellas and chairs. This is the Switzerland that stays under the radar. 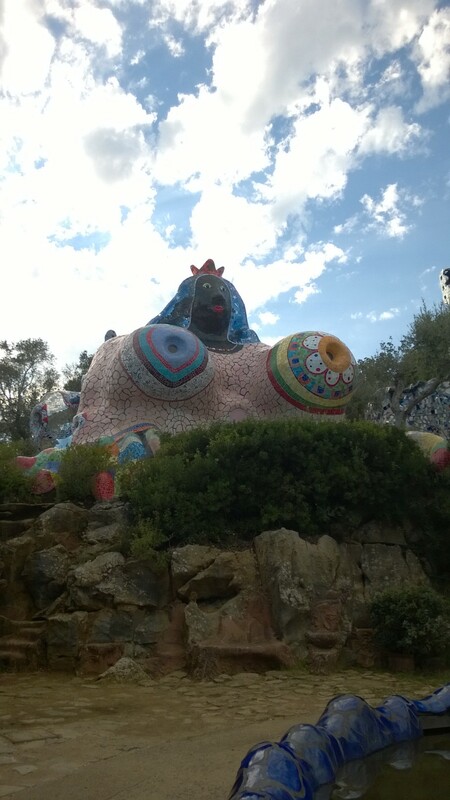 The one that is usually unknown to expats and foreigners and escapes from the stereotypes. The one that reminds you that Swiss people really know how to enjoy life and this is something we all should learn from them.